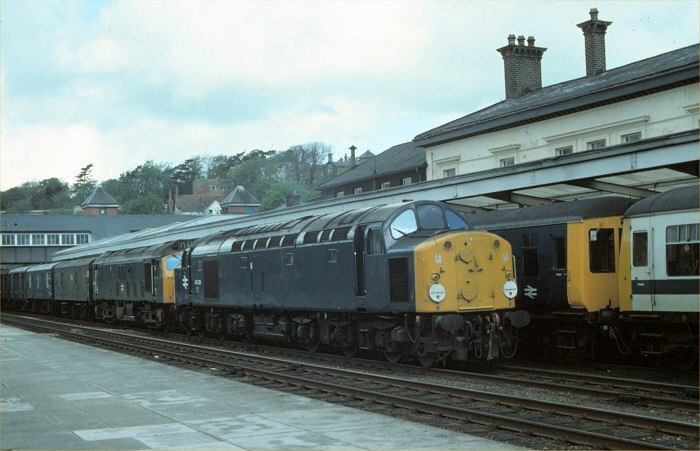 This month's image was taken on Saturday the 14th May 1977 at Bangor. In platform 2, two dmus sit awaiting departure on 2F83, the 12:26 Saturdays Only Bangor to Liverpool Lime Street. This arrived as the 08:25 Liverpool Lime St - Bangor, working in both directions over the Runcorn - Frodsham Jcn freight-only route. Passing on the up through line are 40026 and 25070 with what should have been the 11:44 SO Holyhead - Manchester Mayfield (empty) parcels, due to pass at 12:13. In fact, this train started at Bangor (see picture on the Bangor page). 25 years later, the mail and parcels traffic has long since finished, and Manchester Mayfield parcels depot has closed. There is still a summer Saturdays Only working from North Wales to Liverpool, but the outward working cannot follow the Runcorn - Frodsham route, as it is only available in the eastbound direction.